This Dark Chocolate Hazelnut Nougat Bar from Organica combines deliciously dark chocolate with a tasty filling. Vegan friendly. 40g. This product is manufactured in a factory that handles nut and dairy products. Corn syrup*, Dark chocolate*(20%) (raw cane sugar, cocoa mass*, cocoa butter*, vanilla*), nougat* (15%), (raw cane sugar*, hazelnuts*, Cocoa mass*, Cocoa butter*), tapioca flour*, corn powder*, Soyaflour*, palm oil*. Not suitable for those with allergies to peanuts, nuts and dairy. The Organica Hazelnut Nougat Dark Chocolate 40g product ethics are indicated below. To learn more about these product ethics and to see related products, follow the links below. Lovely dark chocolate and chewy nougat. Great! A really lovely vegan treat! 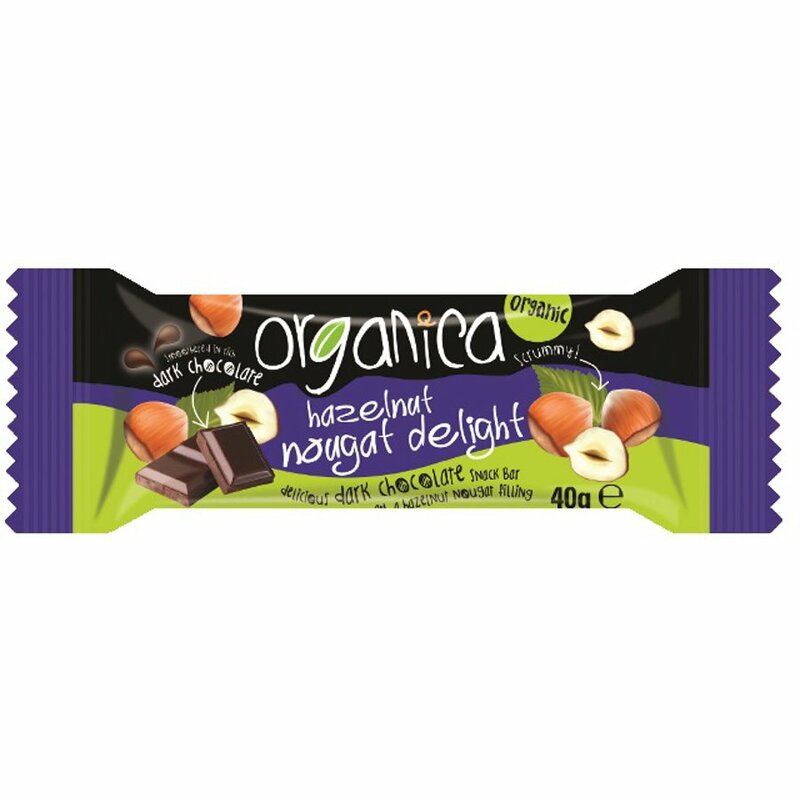 There are currently no questions to display about Organica Hazelnut Nougat Dark Chocolate 40g. Organica is part of a small independent company called Venture Foods Ltd. They pride themselves on their certified organic status, much of their produce is dairy and gluten-free, and all are approved by the Vegetarian society. Based on fair trade principles, Organica works to provide innovative and tasty snacks for the UK market which are sure to delight the taste buds!